published by Black Dome Press Corp. The Hudson River School, America’s first major art movement, is so well known and its artists—Thomas Cole, Frederic Church and Albert Bierstadt, among others—so widely exhibited that it seems inconceivable that one of their colleagues, Jervis McEntee (1828-1891), never received a major museum exhibition until 2015. Kingston, New York, artist Jervis McEntee (1828–1891) was a prominent member of the loosely connected group of American landscape painters. He was greatly admired in the nineteenth century, but has not seen the resurgence in appreciation and public interest that artists like Cole, Asher B. Durand, and Church have received. McEntee studied under Frederic Edwin Church, the Hudson River School’s most successful painter, was an artist-in-residence at the famous 10th Street Studio Building in New York City, and was a member of the National Academy of Design. He counted among his friends Sanford Gifford, Worthington Whittredge, Frederic Church, and Edwin Booth, assassin John Wilkes’s brother and the foremost American actor of his time. His studio-cottage in Rondout (Kingston) was designed by another close friend, Calvert Vaux, one of the 19th-century’s legendary architects and landscape designers, co-designer New York City’s Central Park. McEntee was one of the most distinctive American landscape painters of of the 19th century, but has not been sufficiently appreciated or accessible in modern times, even locally in the Hudson Valley. 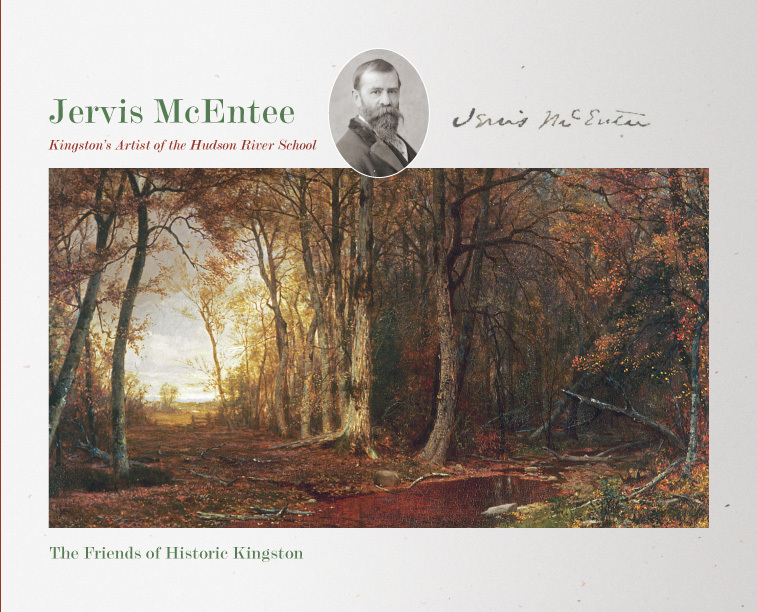 Jervis McEntee: Kingston’s Artist of the Hudson River School aims to help provide new visibility for an artist who remains relatively unknown even in Kingston, where there is no regular opportunity to see his art. Inspiration for much of his artwork came from nature, the landscape that he saw around his hometown of Rondout, a busy river port that later became part of Kingston, and in the nearby Catskill Mountains. McEntee’s father, James, was the resident engineer for the Delaware and Hudson Canal, which brought coal from mines in Pennsylvania to Rondout for shipment to New York City. 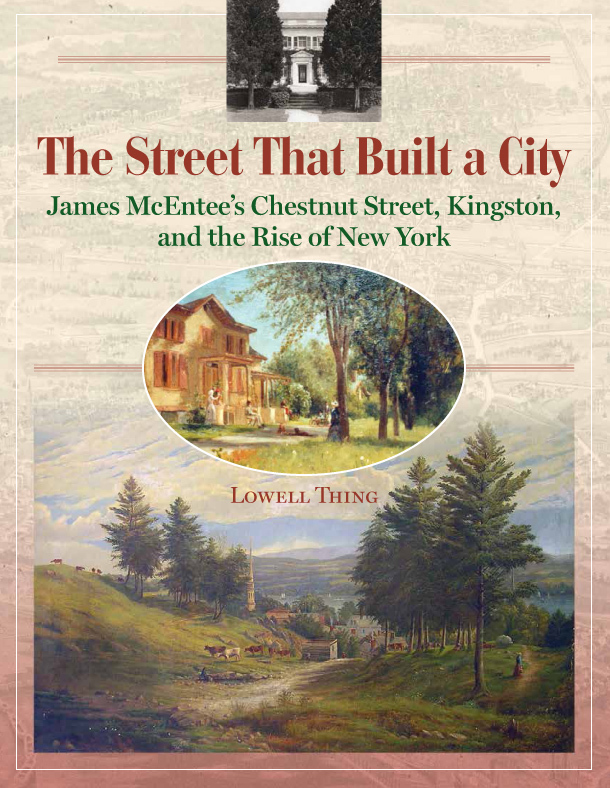 James McEntee built a homestead on a hill overlooking the Hudson River that later became West Chestnut Street. Jervis McEntee and his wife Gertrude lived there for the rest of their lives, dividing their time between Rondout and his painting studio in New York City’s Greenwich Village. His studio-cottage that he built next to his parents’ house was designed by his brother-in-law Calvert Vaux. McEntee today is remembered as much for the journal he kept as he is for his paintings. That journal, which McEntee faithfully recorded from 1872 to 1890, has become the most important record of the lives and concerns of the landscape painters of the Hudson River School. This book, with its 26 full-color paintings, includes a number of McEntee’s works not previously seen by the public, as well as family photographs from several of his descendants.